If you’re a breakfast person, I’m sure you must have tried or fell in love with what I like to refer to as the lighter version of pancakes, the crepe. Crepes are great breakfast foods that can be described as really thin pancakes. What I like most about crepes is that they go well with both sweet and savory foods, making them the ideal breakfast food for the whole family. However, crepes can be quite difficult to make, especially when you don’t have the right type of pan in your kitchen. 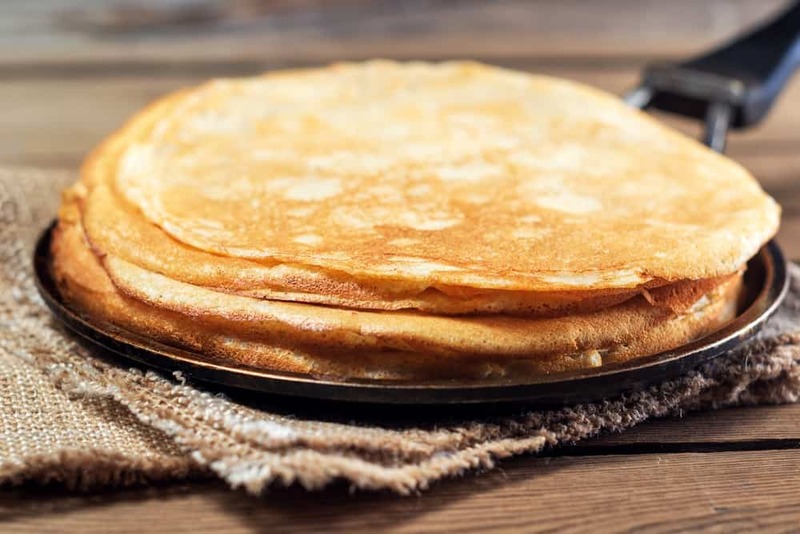 Don’t worry if you don’t know a thing about crepe pans, because in this article, I will be sharing with you some basic information about the different types of pans that you can use to make crepes, as well as a list of the best crepe pans you can purchase online. Read on to learn about crepe pans now! As you may have noticed, there are different types of pans you can use to cook all sorts of foods in your kitchen today. The type of pan you use can heavily affect the overall quality of your food. Blue steel pans aren’t the practical choice when it comes to making crepes, but with enough skill, you can use this pan to make fine golden brown crepes with ease. Do keep in mind that to avoid getting burnt crepes, you will need to strictly monitor the heat coming off this type of pan since it heats up pretty fast. Anodized aluminum pans are known for their non-stick surfaces. Sure you can use this type to make crepes, but you should still use butter, oil, or a non-stick spray on this pan so that the crepes can fall off the pan on their own. Teflon pans usually come with a reliable non-stick coating, making it great for cooking thin crepes. However, Teflon pans tend to heat up pretty slow, which can lead unexperienced cooks to overheat the process of waiting for the perfect temperature. The flat iron pan has got to be the ideal type for making thin golden brown crepes. What’s great with flat iron pans is that they don’t warp over time, and has an even heat distribution. If you want to make perfect crepes, I recommend getting a flat iron pan with low-edges for easy spatula-flipping. Larger crepe pans tend to be easier to handle since you would have enough space to spread your batter. If you are used to using a spreader when making crepes, you should go for pans with 10-inch diameters. Crepes can be a bit hard to flip especially when you don’t have much experience in making them yet. If you are a beginner, you might end up ruining your crepes in attempt to separate them from the pan with a spatula. For ease of use, you should of for shallow pans with low skirts so that you will be able to place your spatula in the pan without ruining the sides of your crepes. Depending on how you cook crepes, you may want to throw in a flip or two as you cook them up. 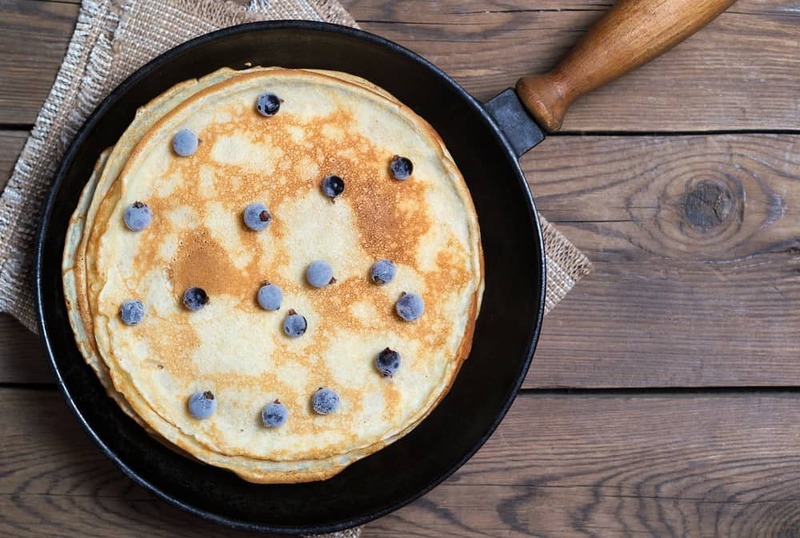 In order to do successful crepe or pancake flips, you should make sure that the pan you are buying has a very comfortable grip that will not let the pan slip from your hands. Cuisinart’s 10-inch Classic Nonstick Hard-Anodized Crepe Pan is a great product that will allow you to make thin crepes at your home. It’s large diameter will allow you to easily spread the batter using the pan alone. This means that you wouldn’t need to buy a spreader to make evenly thin crepes. Aside from having a large surface area, another great feature of this pan is its low sides that make using a spatula very easy. It even comes with steel riveted handles that stay cool even when the pan is left in an open stove. This Anolon Bronze crepe pan is surely an eye-catching piece. Aside from having a stylish look to it, it comes with a completely non-stick exterior that’s not only great for making thin crepes, but can be easily cleansed as well. For added durability, this pan has been hard-anodized and has been made with oven safe materials. Even its handles are oven safe, and can withstand temperatures up to 350 degrees Fahrenheit. Another great crepe pan by Cuisnart is the FCT23-24NS French Classic. This 10-inch crepe pan eliminates the need for a spreader since its large surface area allows you to spread your batter with a simple swivel motion of the pan. This pan is made with a pure aluminum core that is covered with tri-ply stainless steel that makes it very durable and long lasting. It also comes with a heat surround technology that ensure even distribution in the pan. What’s more is that aside from making perfectly golden crepes, you can use this pan to effectively sear delicate fish, create omelets, or to fry other types of food. Great for making crepes, searing fish, and frying food. This 7-inch crepe pan might be smaller than the others included in this list, but what it lacks in size it makes up for in durability. This crepe pan is made with high quality extra strong steel that evenly distributes heat. It also comes with an extra strong steel strip handle that will let you flip pancakes or crepes with confidence. However, you will need to season this pan first before you use it to make crepes. You can easily do so by placing it in hot running water for a couple of minutes and by scraping the protective layer away with a cleaning brush. After washing the pan, use it to fry some sliced potatoes with plenty of salt for a couple of minutes, and then discard the contents to wipe it clean with a paper towel. Once cleansed again, simply rinse it with hot water, dry, and grease lightly. This affordable blue steel crepe pan is great for making crispy batches of crepes. 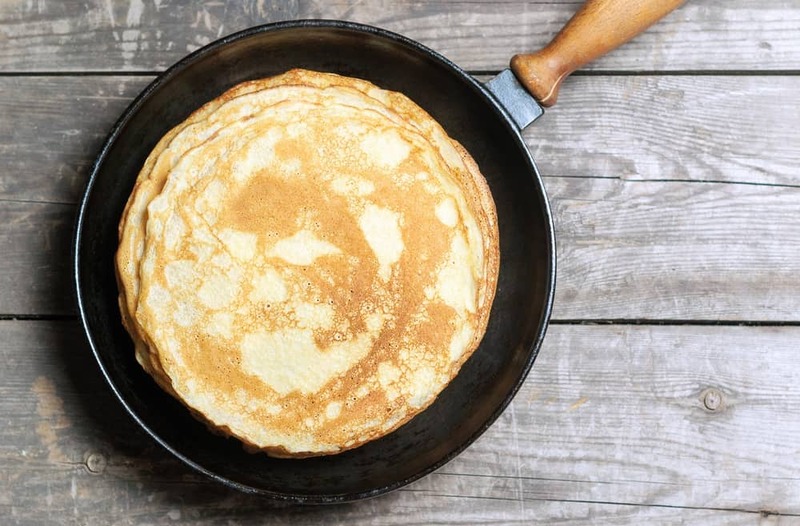 Though this type of pan isn’ the ideal type for beginners, with enough practice, you will be able to make golden brown crepes in your kitchen with ease. Unlike Teflon or iron pans, this blue steel pan is very light weight, making it farily easy to handle. What’s more is that this pan comes with a low skirt that will let you easily flip pancakes or crepes with a simple flick of your wrist. Of all the crepe pans I have mentioned, I really recommend that you go with the Cuisinart Chef's Classic Crepe Pan. This pan is a very good pan which I always use for making crepe. Finding best crepe pan is important for making a tasty breakfast. As a breakfast person, you can also benefit from best electric griddle. What makes it worth the money you spend is the ability to let you cook different foods at the same time. If you liked this article, and would like to know more about other cooking tools, please leave us your feedback in the comment box below. Until next time, enjoy!